You don’t need force magic to witness cosmic wonders—just a great telescope. Fortunately, the citizens of Earth have Hubble, which has been capturing the majesty of our celestial landscape for 25 years. 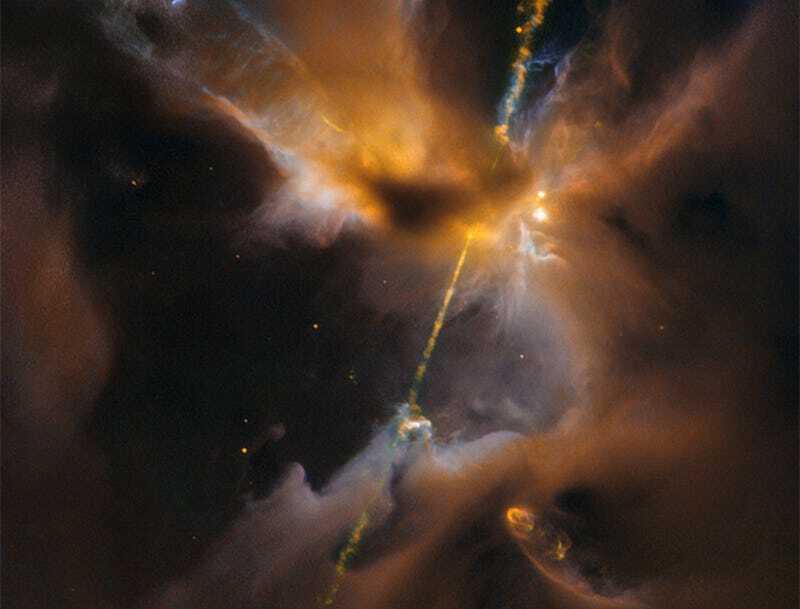 Just in time for Star Wars week, you can now feast your eyes on Hubble’s latest astronomical portrait, which looks suspiciously like a double-bladed lightsaber. It’s the perfect image to keep you stoked for The Force Awakens all day, as you go through the motions of your job counting down the hours until you can leave. But there’s a lot more to this turbulent patch of space than lulzy comparisons to Darth Maul’s high-tech death spear. You’re looking at twin jets of plasma blasting away from an adolescent star at supersonic speeds, searing and cauterizing the surrounding nebula as they go. The star itself burns brightly toward the center of the image, nestled within a thick cloud of interstellar dust. When stars are born inside giant, gaseous nebulas, some of the surrounding material collapses down to form a rotating, flattened disk. Long after the star has finished forming, gas from the disk will continue to be pulled inward by its immense gravity. This celestial rain energizes the young stellar body, prompting it to shoot streams of superheated plasma into space. As those stellar jets collide with and heat the surrounding celestial matter, they create curved shock waves, which manifest as knotted clumps of nebulosity astronomers call Herbig-Haro (HH) objects. This young star offers a striking example of the phenomenon, with dozens of Herbig-Haro objects clearly visible. The entire scene is playing out 1350 light years away, in the Orion B molecular cloud complex located near the Orion constellation. A nice reminder that our galaxy, despite its lack of magical beings, is as breathtaking as they come.